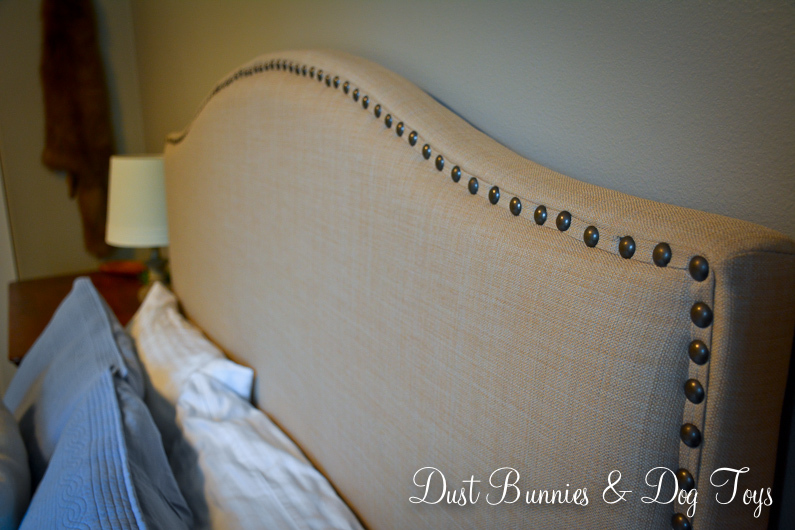 Another quick update we did after our trip to Portland was switching out the guest room headboard. While the old one the Hubs DIY’ed back when we lived in Kodiak was nice (see it here), I was ready for something a little brighter in this space. I still wanted something upholstered and had a few earmarked online but they were ranging from $200-600, which was a bit more than I wanted to pay for something that’s only going to see use a few times a year. Luckily I stumbled across this one at Walmart as part of their Better Homes and Gardens line for $90! It was only available online but I could do site to store shipping. Unfortunately they didn’t offer that for Alaska stores so I had it shipped to the store near my Mother-in-Law’s house so we could pick it up while we were visiting back in May. It’s definitely not perfect. The nail heads don’t line up quite right in a few spots, but it’s hardly noticeable. And at a third of the cost of similar ones I was considering I’m ok with the little imperfections. I plan to sell the old one, which will likely pay for this one, so the change will be low – no cost. 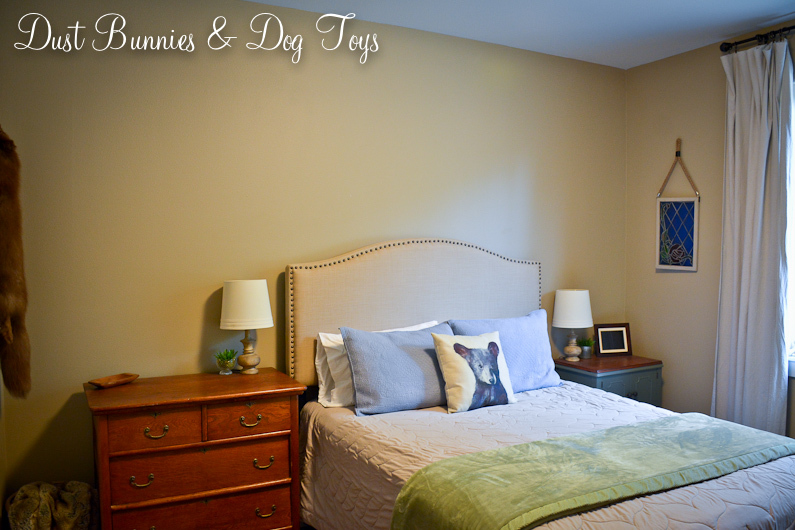 We got it set up just in time for my sister’s visit last month along with the new dresser we added in here. 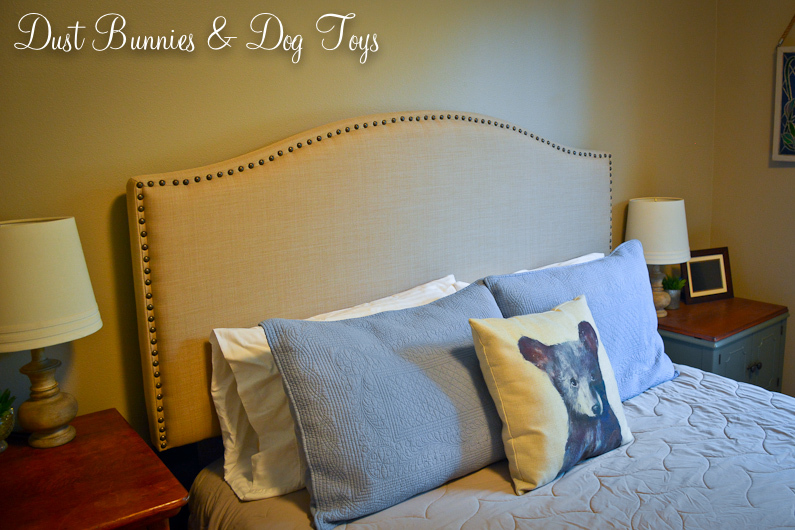 The two pieces work well together and give the space a calm, simple tone. 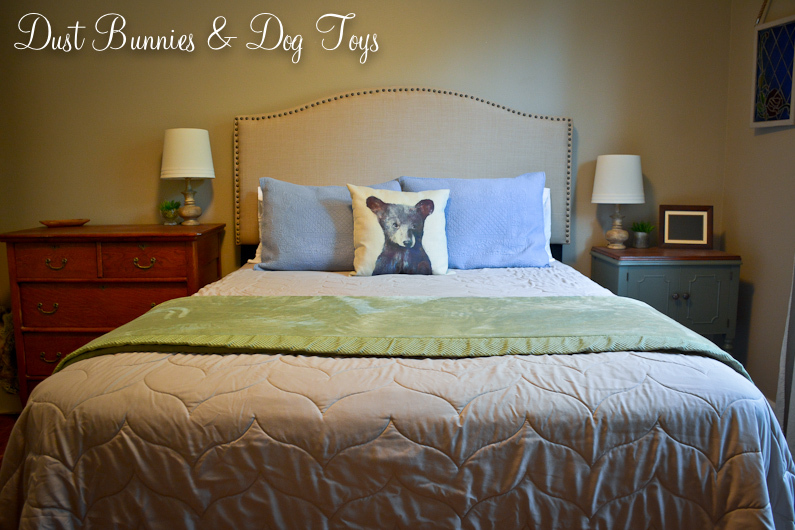 Because it’s neutral I can change up the bedding or other furnishings without an issue. I’ve got plans to add faux shiplap to this wall like we did in the dining room but that’s a project for the spring when it’s still to cold to be outside. 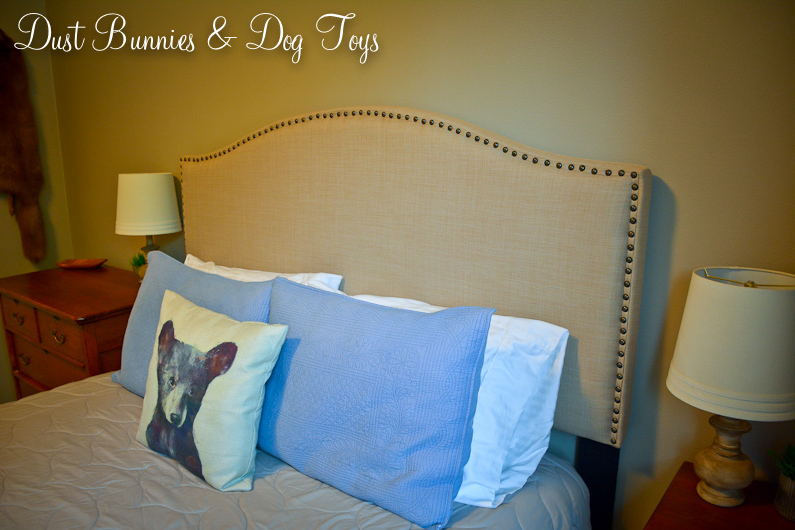 Once we do that I think the headboard will really pop against the white and the space will be even brighter. 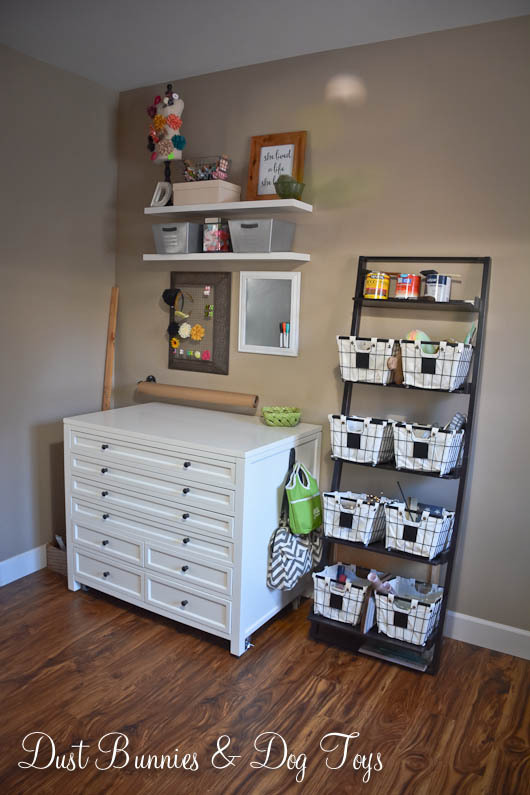 I recently added some new organization to my crafting area that I’m pretty excited about. 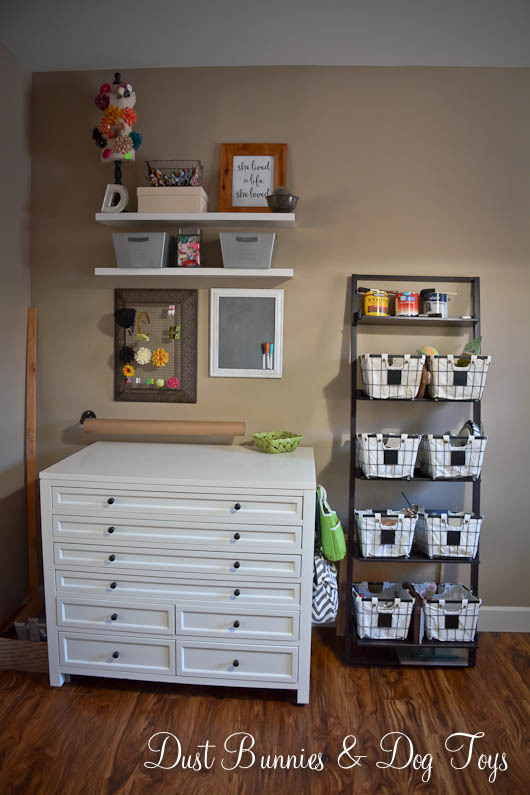 Although I have tons of storage for tools and small materials in my craft cabinet, I often found that I had larger items saved for projects stashed away in other parts of the house and being out of sight, I often forgot about them. So when I spotted a simple ladder shelf on the buy/sell page for $25 I jumped on it. 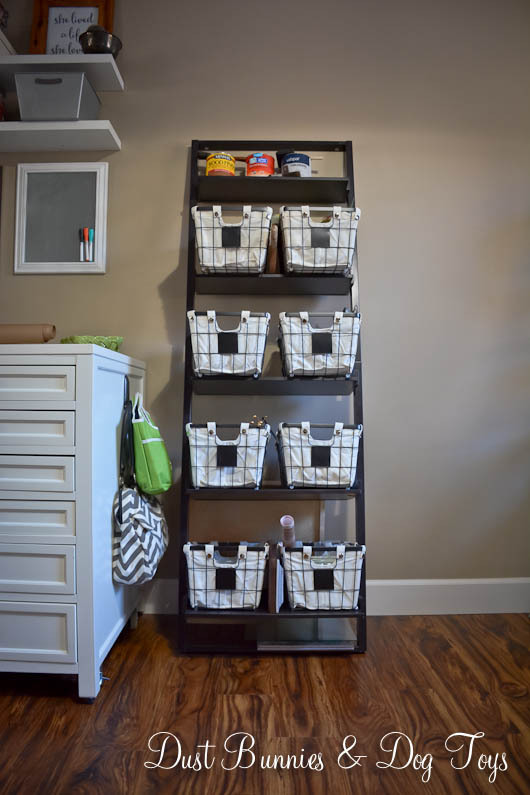 I knew right away that the wire baskets from the Better Homes & Gardens line I’d been lusting after would work perfectly on the shelves. Unfortunately my local stores didn’t carry the baskets so I had to order them online and wait for them to arrive. 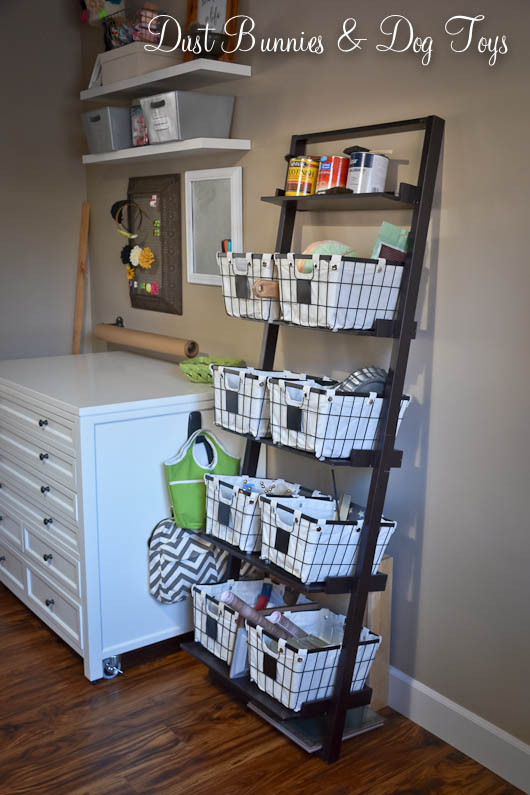 Once they did, I placed two on each shelf and organized my various project materials in them, leaving the narrower top shelf for my paints and stains. I also had room to slide a large item behind the lower shelves and rest several flat pieces on the bottom of the shelf frame. 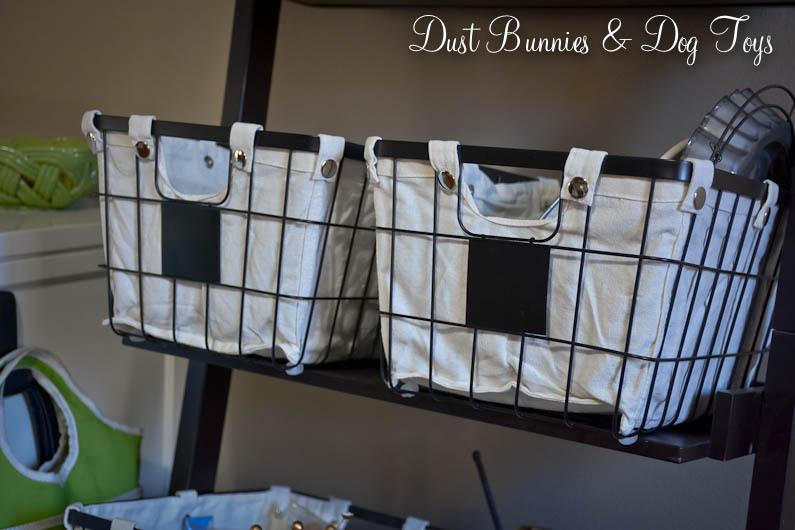 The baskets are the perfect size to hold all those oddly shaped pieces and the canvas liners keep little parts contained. They even have chalkboard panels on the front, so I can add labels to them and easily change them as inventory changes. I’m not sure where the past week has disappeared to but I certainly don’t want it back. I’ve been handling some mini “crises” at work, preparing for a trip, dog sitting a VERY active puppy and just trying to keep the to-do list flowing so I haven’t had time to work on projects or edit photos of ones I’ve done recently. Hopefully this weekend will provide some much needed catch-up time. Until then here’s a quick look at some new wax warmers I got and am really loving. Long ago the hubs and I made an agreement that I should not have burning candles because I tend to forget them, which is obviously not very safe. So instead I have flameless candles for decorating and wax warmers for scents. I used to have the table top style warmers but have recently moved to the smaller outlet style option because they are easier to clean and don’t take up horizontal space. 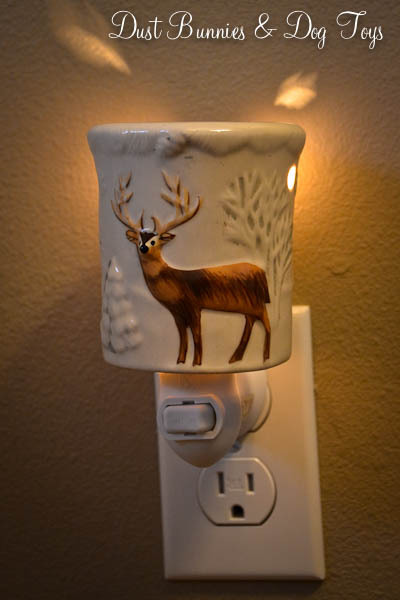 I like to have a themed warmer in the entry way and loved the simple winter look of the one seen above. It went up before Christmas and will probably stay put until spring officially arrives in Alaska. This one is in the master bathroom and provides a wonderful glow. 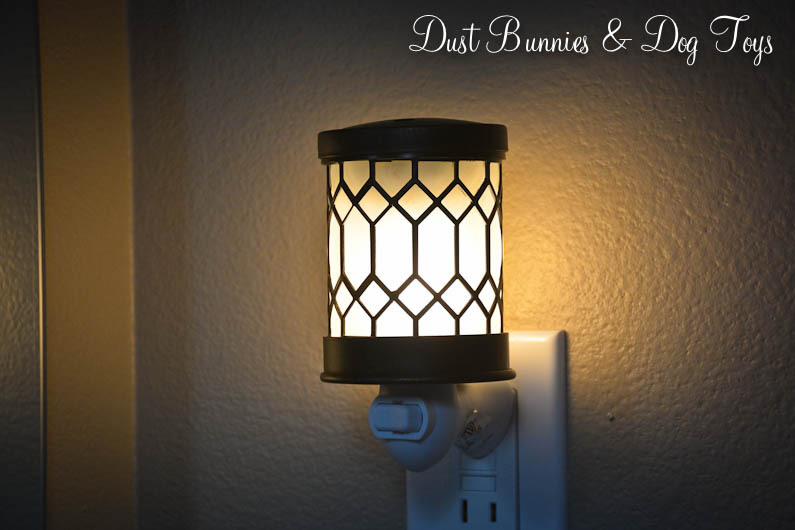 It’s the perfect nightlight with just the right amount of light to let you see what you’re doing but not be a shock to tired eyes. 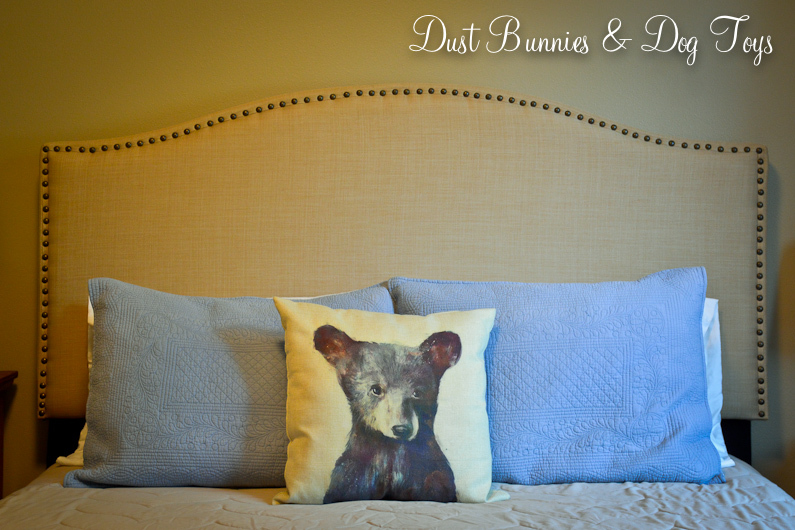 The beautiful pattern and metal tone of the finish are an added bonus. Even the hubs commented on how nice it was! Since we were so happy with this style in our bathroom I decided to get one for the hall bath as well. I originally planned to buy the same one again, but noticed this pattern from another brand on the same shelf and thought it would have a similar glow. It does and the simpler design fits well with the décor in the hall bath better. 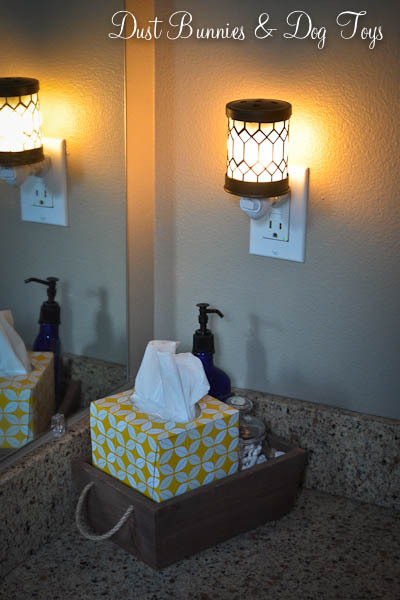 Now our guests will have plenty of light to see what they’re doing if they need to make a trip to the bathroom in the middle of the night. It also illuminates the little basket of essentials I put out below it which is also helpful. 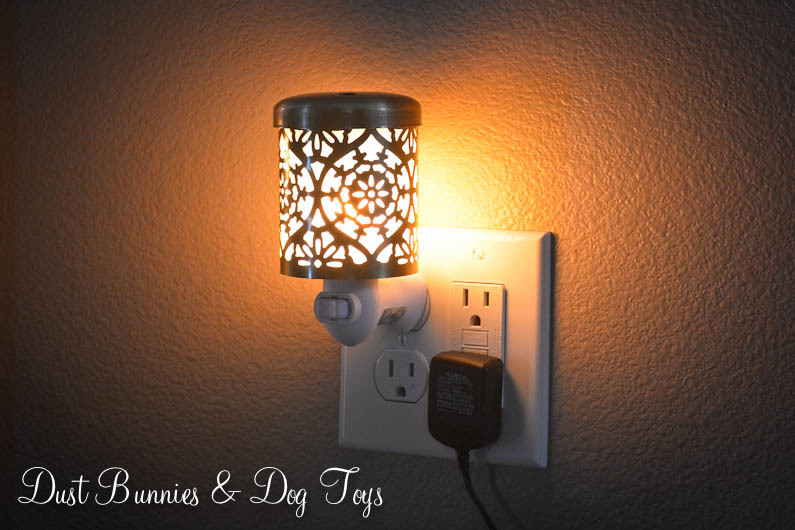 The first two warmers are from the Better Homes and Garden line at Walmart, but the one in the hall bathroom is from brand called ScentSationals also from Walmart. All three came with toppers for the wax area which give them a cleaner look than the open air ones I’ve had in the past. I choose not to use the topper on the winter version just because the wax bowl isn’t very large so I didn’t want the topper sitting in wax if I put two cubes in, but it works just fine without it. The warmers I had in these locations have since moved to other areas of the house or been sold so it was an efficient change as well.